101 Piece Set. 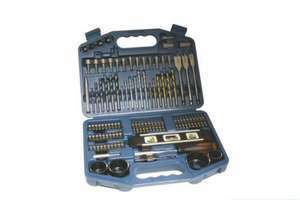 Includes assorted drill bits, holesaws, spirit level, bit holder and assorted screwdriver bits. 6 x wood drill bits, 6 x masonry drill bits, 6 x HSS drill bits, 3 x flat bits, 30 x 25mm screwdriver bits, 20 x 50mm screwdriver bits, 13 x nut runners, 4 x holesaws, 1 x holesaw arbor, 1 x magnetic bit holder, 1 x centre punch, 4 x drill depth stops, 2 x screwfinders, 1 x hex key, 1 x counter sink, 1 x screwdriver handle, 1 x level. Cheers op i think I'll get one of these tomorrow. This doesn't qualify for the 20% discount unless you spend more than £20, so the total price is misleading. Find something instore for 3p+ chewing gum at the till? remind us about the club members ?? Similar deal was here before and from what I saw from reviews these drills are not the best quality. If you do now and then some home DIY then they should do but wouldn't buy them if you use stuff like that for a living. Got one of these and the quality of the drill bits is shocking! Really not up to the quality of other Makita stuff I have. always around this price, decent little kit. Bought this last year - it's cheap chinese rebranded kit, not strictly Makita. Been cheaper than this at screwfix too. Still... ok set for occasional use. Bought this last year - it's cheap chinese rebranded kit, not strictly … Bought this last year - it's cheap chinese rebranded kit, not strictly Makita. Been cheaper than this at screwfix too. Still... ok set for occasional use. Agreed, I bought this kit a few weeks ago from B&Q, I find the smaller drill bits don't clip in to their position properly; Hence you push them in too hard and they bend! I already can't use a couple of the small bits as they are now too wonkey! Don't get this for drill bits as there very soft metal but good price. What about this set then? There's not many drill bits in there, it's mostly screwdriver bits ! These are always on offer for £19.99 at Screwfix! Cheers rogercat, joined up! Didnt know it existed. (_;) Sorry Cheers to londonuk and rogercat for asking!